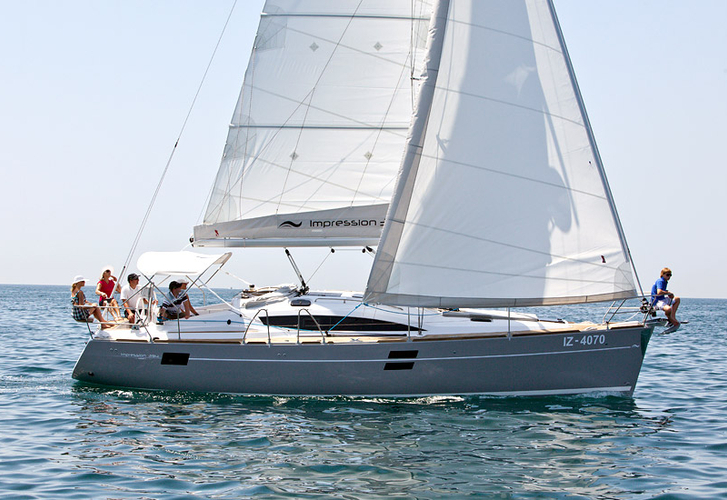 Escape is a name of boat Elan 394 Impression ,which has been built in 2014. You can charter this boat from marina Sibenik in area of Sibenik. Escape is equipped with 8 sleeping places. Berths on the vessel are configured in 8 (6+2) layout. 3 cabins are situated inside the sailboat Escape. Use the search engine for search for more offers clicking here: Yacht charter Sibenik. Passengers can feel comfortable on this sailboat , because there are 2 heads for their disposal. Vessel's dimensions are: LOA - 11.90 m , beam - 3.91 m and 1.8 meters of depth. On the vessel you will find following equipment: TV, Radio / cd player, Bimini top, Teak cockpit, Anchor electric windlass, Dinghy, Plotter gps in cockpit, Autopilot, Bow thruster. . Nonrefundable caution is at the level of 1500.00 EUR. In our search machine you can effortlessly check avalailability of yacht Escape from Sibenik by opening this link: Yacht charter Croatia.